As far as skin conditions go, eczema has to be one of the worst. I had eczema as a kid, and although I was lucky enough to outgrow the worst of it, I still get the occasional flare up every so often. The inflammation and itch are bad, but I’d say it’s the pain and tenderness that make it pretty unbearable. And like most skin conditions, doctors are quick to prescribe topical steroids and mystery creams to hopefully make it (and you) go away. If only I’d known about this natural eczema balm back in the day, I may have saved myself years of misery. Thanks to raw honey and essential oils, it naturally helps soothe everything from the dry skin to fiery flare ups. This all natural oil-based balm is a godsend for irritated skin. I keep a jar on my bedside table to remedy flakes and inflammation all year long. The main ingredient is coconut oil, which is an intensely hydrating oil perfect for chapped, irritated skin. 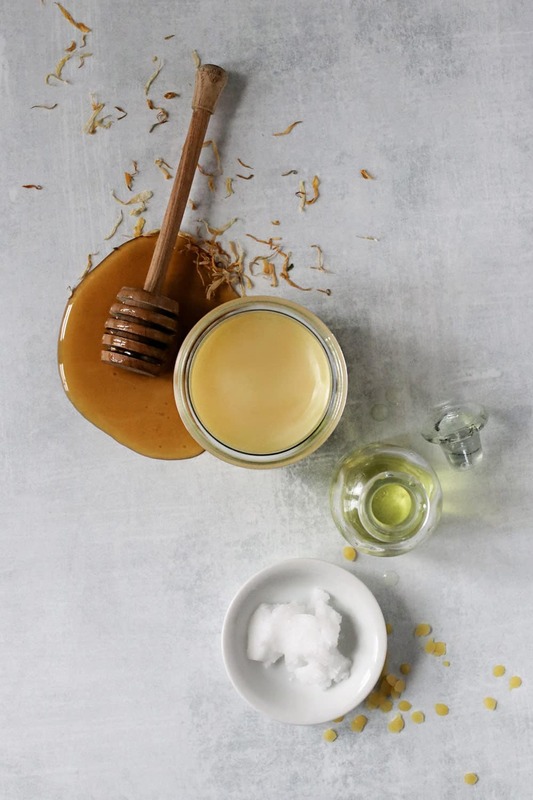 Plus beeswax and almond oil give you an emollient-rich balm that locks in moisture and protects skin from the elements. But it’s the raw honey and essential oils that do most of the healing. Honey is said to be one of nature’s most powerful soothing agents. It helps kill bacteria, reduces inflammation and cools the itch that comes with eczema. And essential oils like chamomile and cedarwood help put out the fire and repair your skin’s moisture barrier. That being said, it’s important to remember that the causes of eczema vary from person to person. Allergies and environmental triggers are often at play and what works for one person might not work for another. It’s best to experiment with essential oils and a find a blend that’s perfectly tailored to you and your skin’s needs. Essential oils aren’t a one-size fits all remedy but with a little trial and error you’re sure to find a blend that works in soothing your worst eczema symptoms. Here are some of the best essential oils for eczema. Lavender oil has exceptional anti-inflammatory and anti-itch properties. It’s often used to soothe the redness and irritatation associated with atopic dermatitis. There are different types of chamomile, but German chamomile is great at calming acne, eczema, rashes, dermatitis and other skin conditions and encouraging cell regeneration so new, healthy skin can take its place. Bergamot oil is often used to reduce inflammation so skin can heal more quickly. A natural antiseptic, thyme oil is a great defense against pain, swelling, infection, and inflammation. Frankincense oil has been used for hundreds of years to heal skin conditions of all kinds. Not only does it reduce swelling and redness, it also increases the potency of the other oils it’s blended with. Cedarwood oil doesn’t just treat the symptoms of eczema, it helps heal the condition as well thanks to its anti-itch and anti-inflammatory properties. Just a dab or two of geranium oil is enough to reduce swelling and pain associated with cracked, irritated skin. 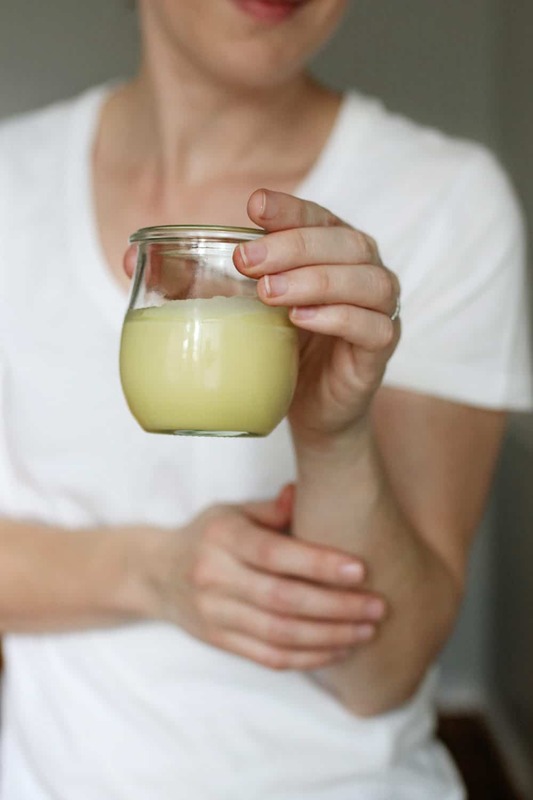 As always, do a test run before making a large batch of balm and give it time to work before trying new oils. Unlike a lot of prescription creams, essential oils work slowly so you need to apply them regularly to see results. And feel free to mix and match oils or add in new ones altogether in order to find a combination that works for you. 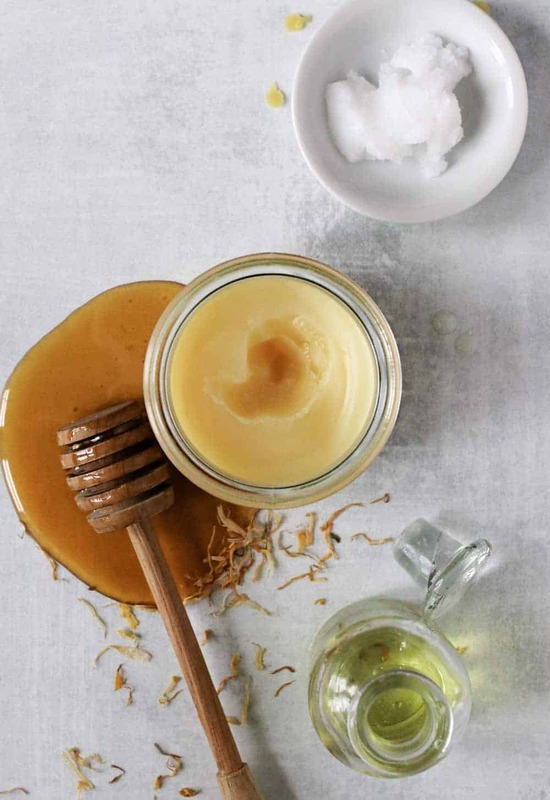 Place the coconut oil, shea butter and beeswax in a heat proof glass jar. Fill a saucepan with a couple inches of water and bring to a gentle simmer. Place the glass jar in the water and wait until the ingredients have melted completely. Remove the jar from the water and set aside for a 5 minutes to cool slightly (this helps preserve the active compounds in the honey and essential oils). Add the honey and essential oils and stir to combine. Transfer the balm to a small tin or lidded glass jar and let it cool completely. Use within a year.